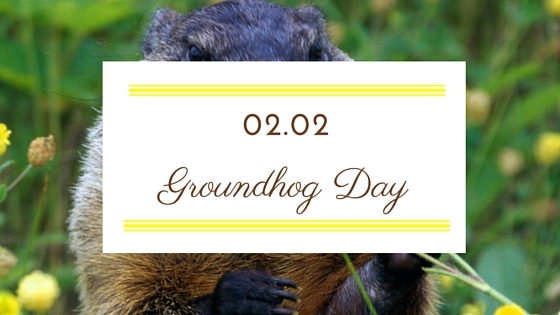 Every year on the second day of the second month in the US we have Groundhog Day. It's tradition and think what you think of it... the tradition will continue on. The first time I ever remember groundhog day, was back in 2001, when I moved here from Switzerland. With the jet lag I was awake everyday at the crack of dawn, waiting patiently for my 1st or 2nd day of work to start. They had given me a temporary room in the hotel where I worked, so I decided to turn on the telly and there it was, one of the most amusing things ever. Ok, maybe I get amused easily... but it was interesting! Thinking about it, my host family back in Morgantown probably showed it to me, but in those days, at 16, I probably didn't really care too much about it to remember, because I don't. My first memory of it, like I said, it sitting in a hotel room, turning on the tv and watching this rather amusing event take place. The origins are debatable, but the main event, the one that everyone talks about and the one that everyone talks about happens in Pennsylvania, in a town called Punxsutawney. It happens every year, since 1887* (from Wikipedia), when Phil, the groundhog will come out of the tree and if he sees his own shadow, it means we will have 6 more weeks of winter and if he doesn't, then spring will come early. I actually thought there was only that one groundhog, in PA, but apparently the event happens in different parts of the country too with other groundhogs... Ohio, Colorado, New York... they all have their groundhog. And I have also read, if I'm not mistaken on Animal Planet (I can't remember) that they come out of their burrows to in order to mate... I haven't done much research on that because it's not the point of this post. After that one time, back in 2001, I never caught the event live again on the telly. I remember it being long and there were speeches and all of that stuff. Apparently there is a festival with food, folk songs, plays and all kinds of different things and the most important thing, in the event in PA, you can only speak a german dialect. If you dare to speak English you must pay a fine*(also taken from Wikipedia). If you want some entertainment about groundhog day, you can watch the movie that shares the same name, with Bill Murray. whom I love. The movie is ok. I saw it after learning about groundhog day and didn't think the movie was anything special, then again it was so long ago... But the expression: "It feels like groundhog day" will make much more sense once you actually see the movie. They actually usually show it on Feb 1st a lot, now that I think of it, I will try and watch it again, because it's been a while. Have you ever seen the actual event or the movie? Did you like it? Let me know!